Happiness cannot be defined in a single sentence. I mean technically it can, but it wouldn’t be enough. Everyone’s view of and means of achieving happiness is different. It’s both simple and complicated, and sometimes it can be rather frustrating. I’ve come to realize that I am happiest when I am gathered with friends, either at home or out and about, accompanied by food. No, this is not the fat girl talking. This is the person who views food as a means of joining those who may not have much in common. When I first get to know others, it’s interesting how much of an opinion people have on what they eat or drink. Whether it’s that they have allergies/intolerances, they are against certain traditions, or have a passion for certain food groups or dishes – everyone has something to say. Those opinions join us together and sometimes it turns out to be a unity of two food cultures that end up being joined together. One of my favorite comfort foods, ESPECIALLY when I have a group of friends, is Tex-Mex. There is something about salty, cheesy goodness, accompanied usually by some margaritas or other beverages of the like, that just scream happiness to me. 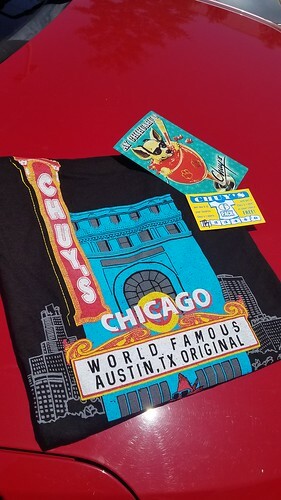 When I found out Chuy’s was opening in Illinois, I was so excited. Then I found out they would be in the SUBURBS of Chicago, and I was ecstatic! The Austin-based chain is not just known for their drinks & dishes made from the freshest ingredients, but also for their family-like atmosphere. I jumped at the opportunity to get there as soon as I was able to – and I was even invited to go behind the scenes and see just how deeply their reputation runs throughout the whole place. We started off getting a tour of the cosmetics of the Warrenville location. While someone else may be known for being “delightfully tacky,” this place screams “wonderfully eclectic”! As soon as you walk in, you can see their Elvis Shrine. Ask someone there about the history behind it. I was going to write it, but you have to hear it from them. Partially because I want you to TALK to the staff – I’m confident that you’ll get the same friendly faces (backed by being knowledgeable too) that I experienced. 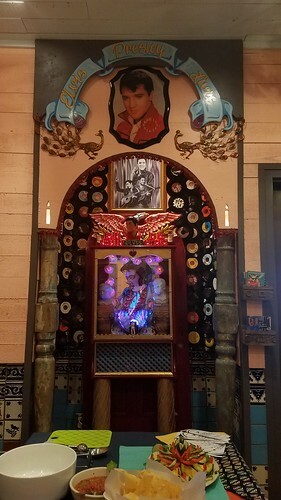 The bar is encapsulated by the funnest decor – thousands of hand-carved wooden fish framed pictures of local dogs (PRO TIP: bring in a framed picture of your furry friend and get a free appetizer AND they’ll hang that baby up around the bar! 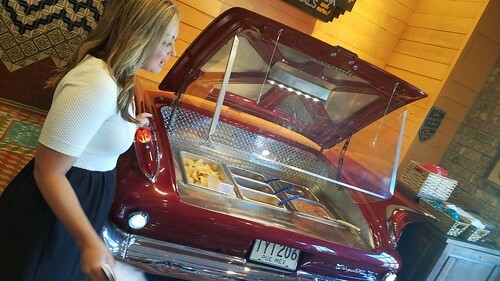 ), and my personal favorite: a NACHO CAR. 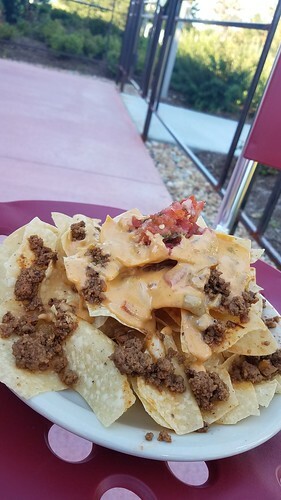 From 4-7pm on weekdays, you can build your own nachos from their freshly made chips, queso, salsa (their salsas are so addicting, but more to come on that in a minute), and ground beef. But ALSO at the bar (which is where I sat this time), you can enjoy the best martini I’ve EVER had. 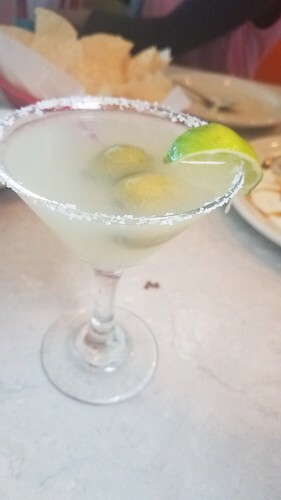 It’s technically a ‘rita but in a martini glass. You look way fancier that way so just go with it. The New Mexican Martini is made with tequila that’s been infused with roasted Hatch green chiles for 24 hours. That baby is made to order, hand shaken, and served with their signature olives (hand-stuffed daily with fresh jalapenos!!!). I’m having withdrawals just typing that. There is so much to write about their food. One thing I pointed out to my friends that night is that every staff member who came by our table had a personal favorite on the menu. But NO ONE repeated a dish! One told me just get the “Big As Yo Face Burrito” (I mean, that title just stands out I think) because their chicken is roasted all day long and & meat is hand pulled daily. 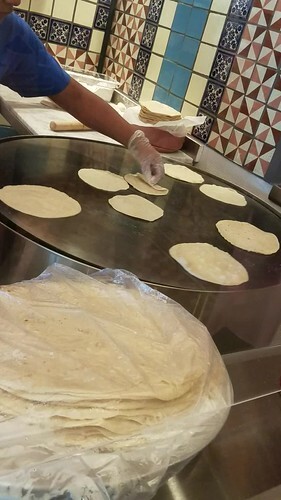 Someone else pointed out that everything was good because they started with fresh homemade tortillas. This is a solid point. You want fresh, you start fresh. One person admitted she had a lot of favorites, but if she had to choose one to recommend it was actually the #7: Vegetarian Combo. And she’s not even vegetarian!! Spoiler alert, neither am I. And guess what I had that night. Yep, the all-meat special. JUST KIDDING – I had to go with what was recommended, duh. The chile relleno, a dish I often order but never write home about, was out of this world! 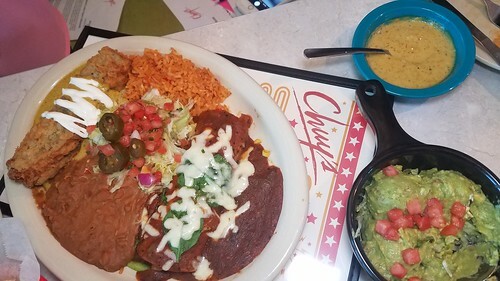 And I actually am addicted, truly, clinically addicted, to the boom-boom sauce at Chuy’s. I may have been told at least 2x what was in it, but I was too busy just inhaling the damn sauce. I dipped literally everything I could in it. 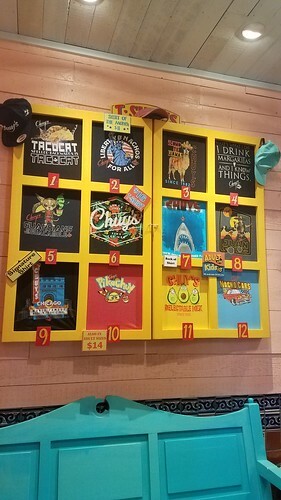 The sauces at Chuy’s are kind of a big deal too. Like, literally, there is so much to choose from, we had to get one of each. Don’t judge. If you were with me that night, you’d understand, okay? Alright, here’s a breakdown. 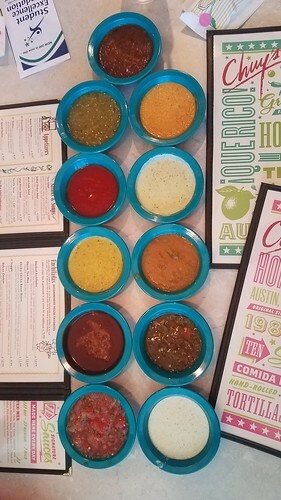 Clockwise, starting with the bottom left: Fresca, Tex-Mex, BOOM BOOM SAUCE, Chipotle, Tomatillo, Ranchero, Queso, Creamy Tomatillo, Green Chile, Hatch, Creamy Jalapeno. And while their menu isn’t endless, I appreciate that they “stick to what they’re good at”. Everything, like I said (did you pay attention?) is made out of the freshest ingredients. When we took a tour of the kitchen, we were even allowed to open their freezer, which honestly is the size of my fridge at home. The ONLY thing in there was their ice cream. Because you can’t keep that in the fridge. Trust me, I tried. Don’t ask. Speaking of ice cream – I didn’t get any. And I almost always get ice cream after every meal. But this time I made the “sacrifice” to make room for a different dessert. 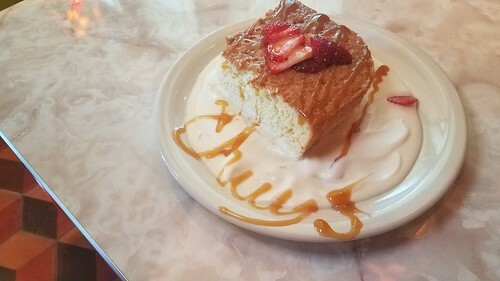 It wouldn’t be a complete trip to a Tex-Mex (or Mexican) restaurant without a tres leches cake. I’ve had bad tres leches before. It ruined everything. 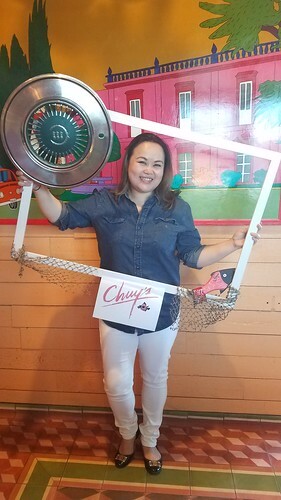 But here at Chuy’s, I can only describe it as “finding happiness”. See that? I tied it ALL. BACK. TOGETHER. Wanna find your own happiness? Was my blog post not enough for you? Fine – go see and taste for yourself! The ONE AND ONLY (for now) Illiniois location can be found at 28250 Diehl Road in Warrenville IL. They open their doors at 11am everyday, closing at 11pm everyday except Sunday, when they kick you out at 10pm instead. Oh and do yourself a favor. When you walk out that door, focus on their swag. Not their walk – I mean their SHIRTS. This is why I heard of them about a year ago. The shirts are so freakin awesome. Look at that Pikachuy shirt!!! And since you’re in the Chicagoland area, you’re obligated to pick up the Chicago one. Like I did. Because I’m chicagofoodaffair. BAM!